With President Barack Obama proposing a relatively flat budget for NASA in 2013, a group professional astronomers is urging the White House and Congress to find a better balance between the space agency's planetary science and exploration needs. The American Astronomical Society (AAS) is asking Obama and Congress to include a greater variety of small, medium and large space missions across the fields of astronomy, astrophysics, planetary science and solar physics. The request comes in response to the proposed 2013 NASA budget, which the White House unveiled on Feb. 13. "The American Astronomical Society, noting the budgetary challenges that the nation faces, appreciates the President's commitment to science, technology, engineering, and mathematics (STEM) research in the FY 2013 budget," AAS members said in a Feb. 23 statement. "Astronomical research, including the study of the sun, the solar system, and the rest of the universe, is a vital part of the research activity of the United States and an area in which the U.S. has been preeminent for many decades." Under the budget request, NASA would receive about $17.7 billion for 2013, which is about $59 million less than the space agency's 2012 funding level. To counter anticipated cutbacks, the space agency is shifting its focus to human exploration and technology, and will slash some science and planetary exploration mission. The agency's planetary science department, in particular, would be cut by 20 percent in 2013, and one mission has already fallen victim to the tightened budget. 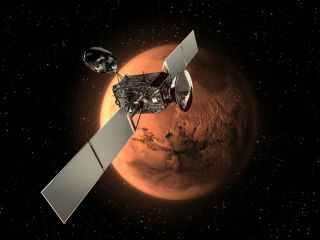 NASA recently announced that it is withdrawing from the European Space Agency-led ExoMars mission, which is aiming to launch an orbiter and then a rover to the Red Planet in 2016 and 2018. "The significant scientific challenges of the future demand reliable cooperation internationally, and NASA, the Administration, and Congress should seek to build up these partnerships in robust and sustainable ways in all of NASA's science divisions, while not degrading the ongoing success of our nation's planetary science activities," AAS members said. The European Space Agency’s ExoMars rover is due to launch toward the Red Planet in 2018. In this artist’s view, note the ExoMars robotic arm and drill. "It is challenging to receive a budget from the President that supports part of our discipline and undercuts another," Kevin Marvel, AAS Executive Officer, said in a statement. "We will work throughout 2012 to encourage Congress to fully support all of the decadal surveys' priorities." The 2013 budget request does, however, provide funding for the James Webb Space Telescope, which is being billed as the successor to the Hubble Space Telescope. The $8.8 billion observatory is currently under construction, but has come under fire over the years because of its swelling budget. "We are grateful that the funding for the James Webb Space Telescope puts it on track for a launch in 2018, and we hope we can achieve a balance of large, medium, and small projects in solar physics, planetary science, and astronomy and astrophysics so that U.S. leadership in these fields can be sustained," AAS President Debra M. Elmegreen said in a statement. The astronomical society is based in Washington, D.C., and is made up of 7,500 astronomers, physicists, mathematicians, geologists and engineers.